The first Universal Yums box of the year for 2018 is from Greece! Let’s see what Mediterranean delights we tried. As the weather has finally gotten warmer, I’ve been craving salads and light, fresh foods so I have been looking for new recipes to try out. This is warm chicken and couscous salad is from Jamie’s Fifteen Minute Meals and is quick (not 15 minutes but still quick) and very tasty. Just make sure you are careful when you’re bashing the chicken and don’t bash your finger like I did, ouch! Put a frying pan over a medium-high heat. Put the couscous in a bowl with a pinch of salt and add 600ml boiling water and cover. Put a pan of boiling water over a high heat and add the frozen peas. Blanch for a couple of minute drain and set aside. Lay out a large piece of greaseproof paper and toss the chicken with salt, pepper, oregano, allspice and the zest of one lemon. Fold over the paper and bash the chicken with something heavy until it is about 1 1/2cm thick. I used an olive oil bottle. Jamie suggests a rolling pin but anything with a bit of heft will do. Add the chicken to the pre-heated frying pan with 2 tablespoons of olive oil. Turn after 3 – 4 minutes until golden and cooked through. While the chicken is cooking, make the tzatziki. Coarsely grate the cucumber and sprinkle with a good pinch of salt. Now squeeze the cucumber with your hands to get out any excess water. Put the cucumber in a bowl with the yoghurt, juice of half a lemon, a pinch of pepper and the finely chopped leafy top half of the mint. Stir together. Deseed the peppers and chilli and then pulse in a blender with the trimmed spring onions and the chopped dill. Scatter over a serving platter with the blanched peas. Tear the olives into pieces and add these as well. Squeeze over the juice of a lemon and add two tablespoons of olive oil. 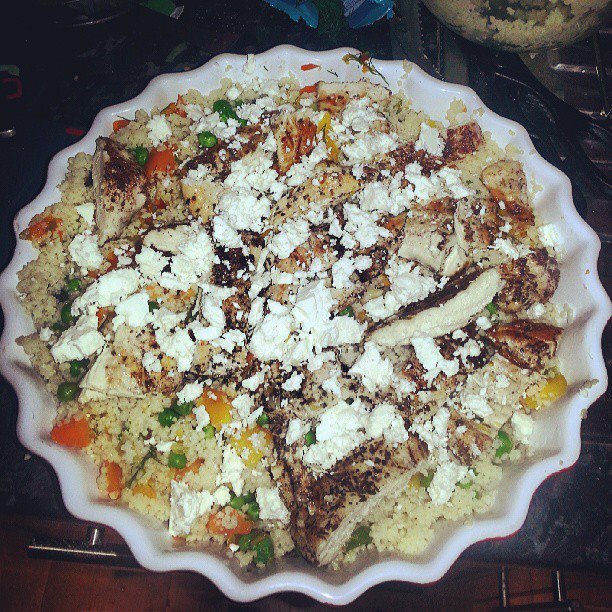 Scatter over the couscous and mix everything together. Slice the cooked chicken and scatter over the platter. Crumble the feta over the top and serve with the tzatziki.